Getting any child to develop good oral hygiene habits, on a consistent basis, is highly important yet can prove to be difficult. As a kid, you would rather play or do anything other than what is perceived as a ‘boring’ activity, like brushing and flossing your teeth. It’s not just because they are rebels, it’s because they can’t see the fun, or even the purpose, in maintaining their oral health. Now you can’t go blaming yourself as a parent; kids and rules are a tricky mix. What you can do, however, is make the process fun for everybody. By doing that, you can help your kids see the value and purpose in keeping a consistent routine for oral hygiene. As your friendly, local child dentistry specialist in the North Brisbane area, we here at Delight Dental are happy to share the following kids dental tips for helping your child develop their dental habits, both at home and at the dentist. There is no such thing as starting too early when it comes to your child’s dental care. As soon as your child’s teeth first come in, typically around the six month mark, you should begin getting them into the habit of brushing. Working as their brushing supervisor, if you will, ensure your child uses a pea-sized dab of toothpaste. While it may look or smell like some kind of treat, teach your child that the toothpaste is not for eating. Flossing, the other key to your child’s ongoing oral health, can begin around the four year mark. By age eight, your little one should be a champion, who doesn’t need your supervision. You can think of brushing and flossing as a superhero tandem. One is good, but together they are dynamic. Brushing is very effective for cleaning the surfaces of the teeth, particularly when using fluoride toothpaste and a soft-bristled toothbrush. You can feel free to ask one of the helpful staff members at our family dentistry practice or your local pharmacy about the best choice for your child. Meanwhile, flossing is a very powerful tool against poor oral hygiene, as it removes the plaque and food particles often missed by the toothbrush. You can gradually introduce your child to the routine of brushing and flossing every day, by making it feel like anything but a repetitive routine. 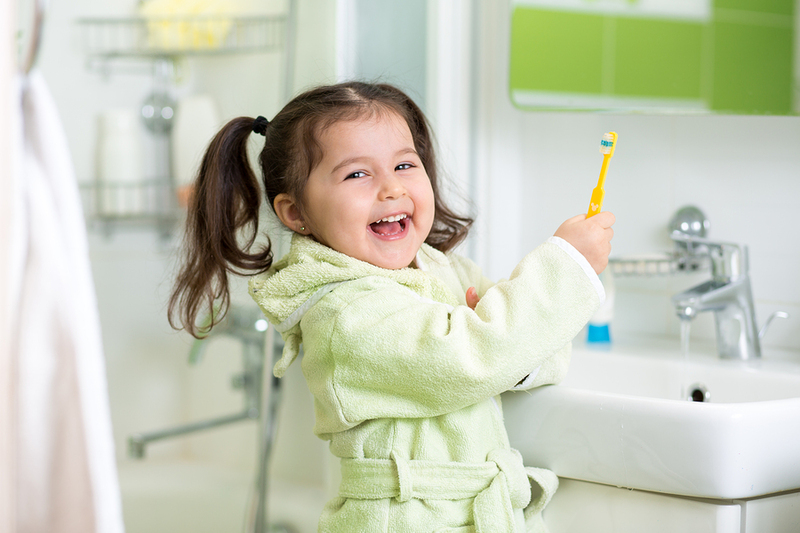 We suggest making a game out of your child’s daily oral hygiene routine, as what kid doesn’t love fun and games. Pretend they are a car with the engine revving, as they gently brush their teeth back and forth. Have your child see how long they can brush their tongue for while counting up from one, stopping when they forget or get stuck. If they need to keep brushing for longer, help them along with their numbers until enough time has passed. Be your child’s central role model, as your actions and behaviour will dictate how they act and perceive things. By taking an active role in their oral hygiene regimen, both as a supervisor and side-by-side participant, your child will develop the idea that brushing and flossing is something worth doing. Good luck and happy brushing!